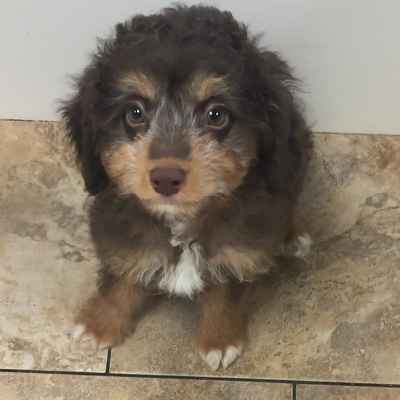 The Mini Aussiepoo is a cross between the Miniature Australian Shepherd and the Poodle. Mini Aussiepoos are very intelligent dogs which can be easily trained. The breed thrives in an environment where they can be challenged. They make for a very good family pet as they are tolerant of small children. The Mini Aussiepoo are playful, sweet social nature. Mini Aussiepoos have a lot of energy so keeping them exercised and busy is the key to calming this energy. As long as there are rgular walks, they can become apartment dwellers.